I am excited to be one of 200+ participating artists in the 12th Annual Small Scale Work for A Larger Cause, a silent auction featuring small scale art pieces from local, regional and national artists. One hundred percent of the proceeds go to benefit SAY Sí’. SAY Sí serves San Antonio’s youth with year round multidisciplinary arts programs providing students opportunities to develop artistic and social skills. The exhibit begins on First Friday, February 6, from 6:00 to 9:00 PM and continues through February 26. The culmination of the event is a silent auction on Friday, February 27 from 5:30-9:00 PM. 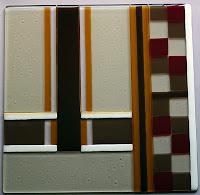 Also, look for the work of other glass artists, like my favorite Nina "Sam" Hibler with Dream Fire Glass. I got a sneak peak at her contribution and I can tell you it was absolutely beautiful. 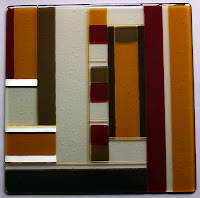 One of the beauties of fusing glass is it can almost always be given a whole new life. 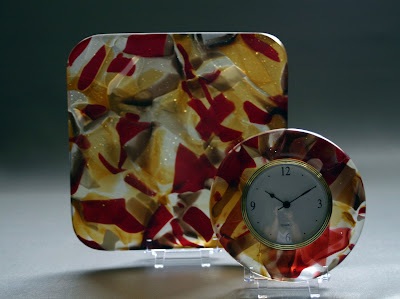 This 9" square sushi and 6" clock was created with the shards of that broken panel. After all, don't we all deserve a second chance. Well with my right hand temporally out of commission there has not been a whole lot I can do, so I have been catching up on my reading. 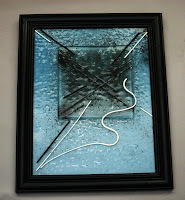 For several months I had been sitting on a book loaned to me by another glass artist and friend. 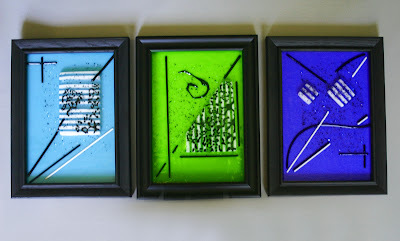 The book was Paul Stankard's No Green Berries or Leaves The Creative Journey of an Artist in Glass. I had started it several times before and not made it very far. I was still gaging my own interest when I came to a section where he described an accident very similar to the one I was currently undergoing. At that point I was hooked. The author/artist tells you about himself and his experiences so openly just about anyone would be able to relate is some way or fashion. My interest peeked, I finished the book in just a few hours after staring at it for months. So often we don't hear about the life of great artists till they are gone and seldom from their own mouths. In telling his story Paul Stankard has offered encouragement, set forth a wonderful example and documented an important time frame in this history of glass. I walked away from this book inspired. The San Antonio Visual Artists (SAVA) Gallery opening for the exhibition "Fresh Start" will be January 8th from 5:30-8:00 pm at the SAVA Fine Art Gallery in Rivercenter Mall. Word is the show is stunning. I can believe it since when dropping off my pieces I ran into a handful of repeat SAVA Gallery artists, old friends and and the work of fellow San Antonio Calligraphers Guild (SACG) members. I can't wait to see how the show looks hung this Thursday. What an exciting way for SAVA to start off the year 2009. Hope to see you there. 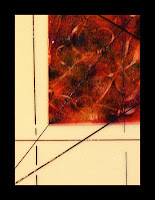 Pablo Picasso said "art is the path of the creator to his work". 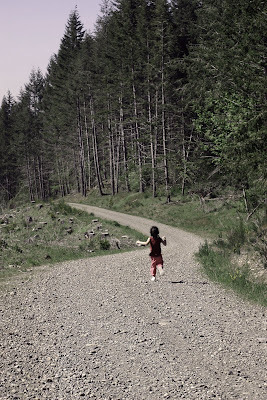 If this is the case I often run down it with child like exuberance, reckless and with carefree abandon. I should note just moments after this photo was taken this three year old tripped, fell face down into the gravel and slide three feet before stopping. What I admire is she then got up, dusted herself off, rubbed the tears from her eyes, and after a hug and a bit of encouragement finished the hike on her own two feet. I can only attempted to do the same as I run down my own path. So, it's not a big surprise that I fell in love with this book but spiral lover or not I think you'll be amazed when you flip through these pages. Aidan Meehan is not only the author but also the calligrapher who's hand created the artwork and lettering that grace all 160 pages. I included a sample below for you to get an idea of the detail that is included though out the book. 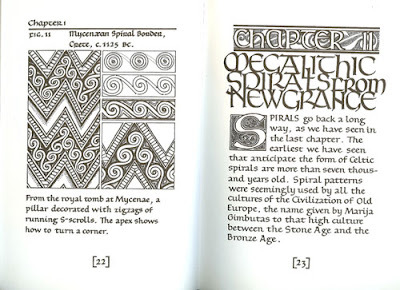 A balance of history, art and instruction Meehan's Spiral Patterns is a delightful read and a wonderful resources. I highly recommend this book not only to those interested in calligraphy but to anyone interested in design and the use of lines to form intricate patterns. Reading the book was pure pleasure for my eyes who enjoyed the change form print medias typical small type to the fluid and natural hand that graces the pages of this book. I'll be keeping this book close at hand and searching for other fascinating reads by Meehan. Examples of the use if spirals in a couple of my pieces. On the left a 4" square sushi plate with a raise black spiral. On the right, a 19" bowl with multiple spiral elements in and on top of the surface.